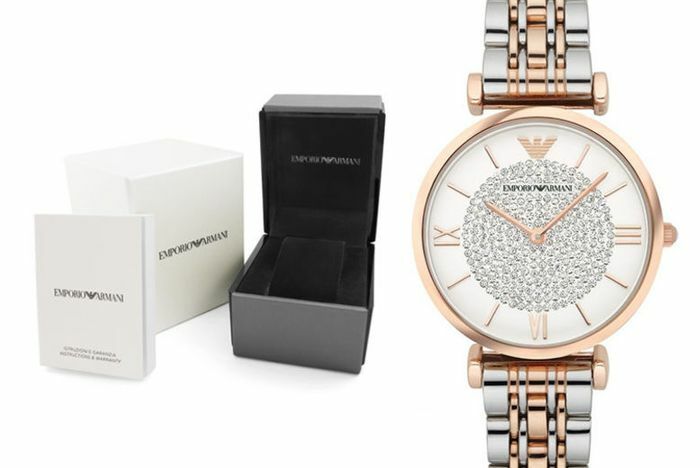 Ladies Emporio Armani Watch - Only £109! Treat yourself or someone special to an Emporio Armani watch. With a high shine, two-tone stainless steel and rose gold plated case. Plus an analogue dial comprising of diamantés and Roman numerals. Stunning watch is powered by Japanese Quartz movement. The perfect present for her! Amazing price!! Might treat myself to a decent mothers day present! I think I deserve it. Thanks for sharing! Wow this looks a great price for this make of watch. Good luck for those that get one. I am wondering if its sold out as can't seem to add to basket? That's an amazing price. Thank you so much for sharing this. Definitely think I'm due a little treat for myself lol.